Want this story as a Tweet or Complete? It's your choice! TWEET: Mazda Releases Custom National Commercial and Other Digital Assets to Promote Marketing Partnership with Universal Pictures. IRVINE, CA - February 17, 2012: Mazda North American Operations (MNAO) today announced its strategic partnership in support of the launch of Universal Pictures and Illumination Entertainment’s Dr. Seuss’ The Lorax, in theatres March 2. From the creators of Despicable Me and the imagination of Dr. Seuss comes the much anticipated feature Dr. Seuss’ The Lorax, a 3D-CG adaptation of the classic tale of a forest guardian who shares the enduring power of hope. Mazda was chosen as a strategic partner for the animated adventure because of its innovative SKYACTIV® TECHNOLOGY and commitment to empower consumers to make more informed choices for their families and the environment. To activate the partnership, Mazda will launch a co-branded national Dr. Seuss’ The Lorax-themed commercial spot based around Mazda’s SKYACTIV® TECHNOLOGY, which increases fuel economy without sacrificing performance. Mazda was able to work directly with the filmmakers to create a :30 and :45 version of the spot, featuring the all-new 2013 Mazda CX-5 small crossover SUV travelling through the “Truffula Valley” featured in the 3D feature. Mazda’s U.S. Director of Design, Derek Jenkins, contributed to the look of the commercial by working with his design team, which is based at Mazda’s R&D facility in Irvine, Calif. The team reviewed early sketches and, working closely with the filmmakers who created Dr. Seuss’ The Lorax, delivered an animated version of the Mazda CX-5. This design was able to capture the proportion and basic look of the Mazda CX-5, while lending it a “Seussian” aesthetic that worked organically with the characters and the feel of the animated adventure. The development of the spot was a unique collaboration between MNAO as a corporate partner, MNAO’s advertising agency, Garage Team Mazda and Chris Meledandri’s Illumination Entertainment and the Paris-based animation house Illumination Mac Guff. 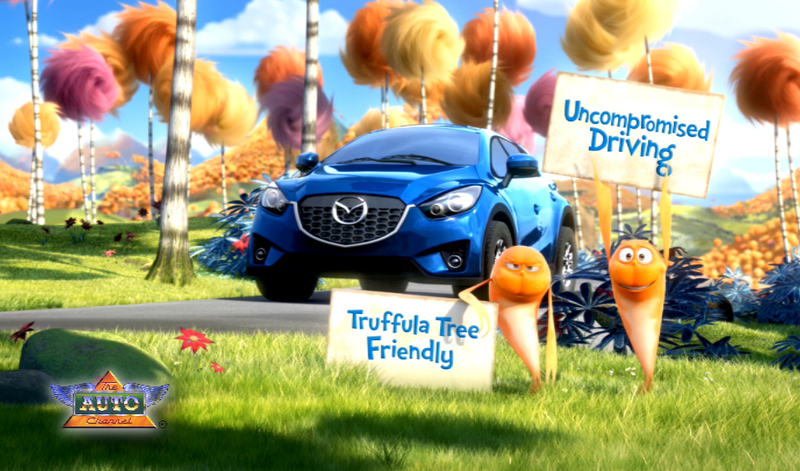 The narrative of the spot features the “Seuss-ified” Mazda CX-5 travelling through the “Truffula Valley.” Around each curve in the road viewers see one of the animals featured in Dr. Seuss’ The Lorax and hear the benefits of Mazda SKYACTIV® TECHNOLOGY. The Lorax also is featured in the spot, and he is brought to life through the vocal talents of Danny DeVito, who voices the title character in the film. Beginning tonight, the custom commercial will air nationally on targeted television networks and on March 2, the :30 spot will run in all theatres playing PG titles. In addition to the TV and theatrical spots, the campaign will incorporate digital assets and social media applications to promote the film partnership. These include a dedicated co-branded Facebook page, a shareable applet and a banner on www.mazdausa.com, MNAO’s official website. Dr. Seuss’ The Lorax opens in theatres nationwide on March 2.